This unique and stylish Safavieh Courtyard area rug will tie any room together in your home. Constructed to be an indoor/outdoor piece, this plush synthetic material rug is sure to make a statement in your home. The machine-made construction of this area rug is sure to withstand wear and tear. You and your guests will enjoy the lovely geometric pattern that decorates this red rug. This Safavieh Courtyard area rug infuses contemporary style into any room in your home. Modernly designed with you in mind, this plush synthetic indoor/outdoor rug will be a great addition to your home. This rug is machine-made, which ensures a strong product. This floral plants patterned red rug makes a bold statement in your hallway, dining room, or even living room. Courtyard Alex Red 8 ft. x 11 ft. Indoor/Outdoor Area Rug This unique and stylish Safavieh Courtyard area rug will tie any room together in your home. Constructed to be an indoor/outdoor piece, this plush synthetic material rug is sure to make a statement in your home. The machine-made construction of this area rug is sure to withstand wear and tear. 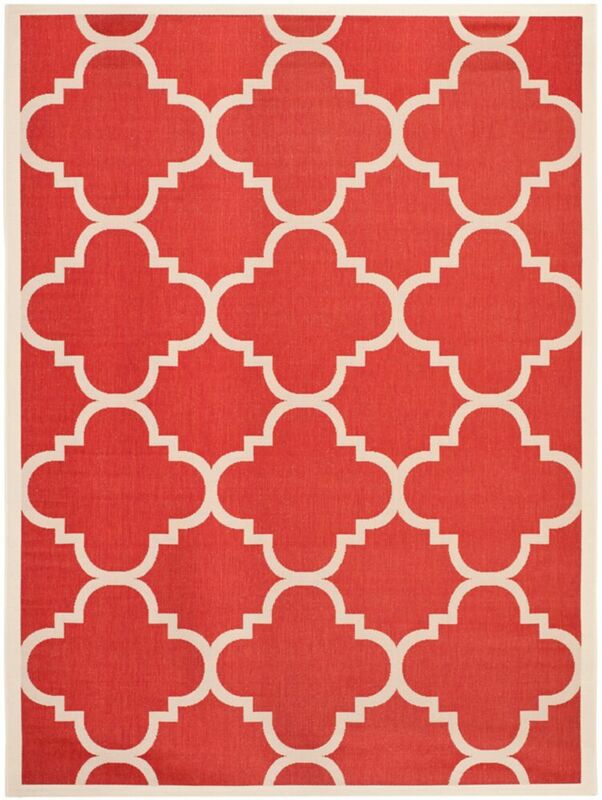 You and your guests will enjoy the lovely geometric pattern that decorates this red rug.